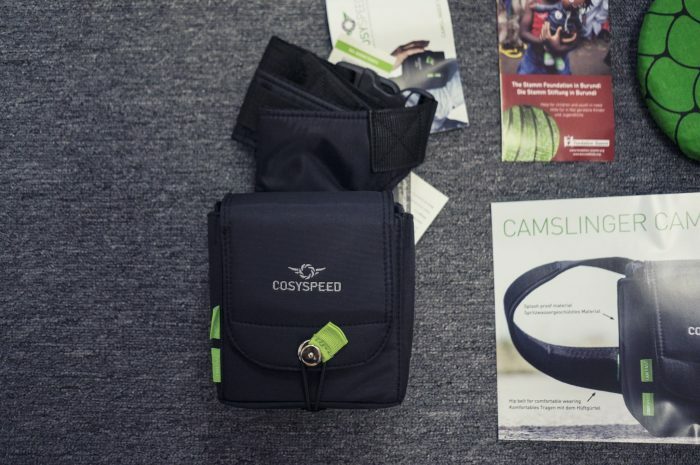 Dear StreetHunters.net Readers, this is the first official review that we are writing and the lucky product that will be reviewed is the Cosyspeed Camslinger Camera Bag. Since we haven’t done any reviews ever before and we have no experience writing one what so ever, please understand that we might not do a perfect job on the first go. What is important though is that we will write the Cosyspeed Camslinger Camera Bag review objectively, based on the experience after using it for nearly one month in the streets. It is imperative that you, our Readers receive our honest opinion. We think it is equally important for the product makers to get an honest opinion also. For each point we examine, we will give the bag a grade from 1 to 10. So for example if we like the size we will give it an 8 or 9 or 10. If we don’t, we will give it a 2 or 3 or 4 and so on and so forth. At the end, we will add up the points, divide them by the number of things we examined and get an average score. Of course one important thing you should take into account is that we will look at this product from a Street Photographer’s perspective only. So let’s get to it! The Cosyspeed Camslinger Camera Bag comes in two sizes. Each size has a different product code. The smaller of the two is the CAMSLINGER 105 and the larger of the two is the CAMSLINGER 160. Personally I found that I prefer the CAMSLINGER 105 size to the CAMSLINGER 160. The reason is that the 105 is the perfect size for my thigh. I have skinny legs in general and the 160 felt to me as if it was protruding from the front and back of my pelvis. The 105 on the other hand was perfect. After trying them both, I shelved the 160, but that doesn’t mean it’s size isn’t good for somebody else. As far as the amount of gear that can fit in the CAMSLINGERS, the 160 definitely can fit more. Any mirroless body with a lens that is up to 10cm long can easily fit in the 160. On the other hand, the 105 doesn’t have so much room. It is ideal for pancake or short lenses, up to 6-7cm but after that the situation becomes a little too stiff in my opinion. I tried the 105 with both my SEL20F28 and my SEL35F18 lenses mounted on my NEX-6 and it was perfect. The SEL50F18 was a little too big, but fit great in the 160. Compared to other camera bags, such as messenger bags or backpacks, both CAMSLINGERS are much smaller, but they are more convenient. We will get to that later. As for their weight. Both models are very light. I wasn’t burdened by them at all. The only time I felt them on my leg was when I was walking with them unbuttoned and the flap kept bouncing up and down, but that has nothing to do with weight really, it has to do with my forgetting the flap open. 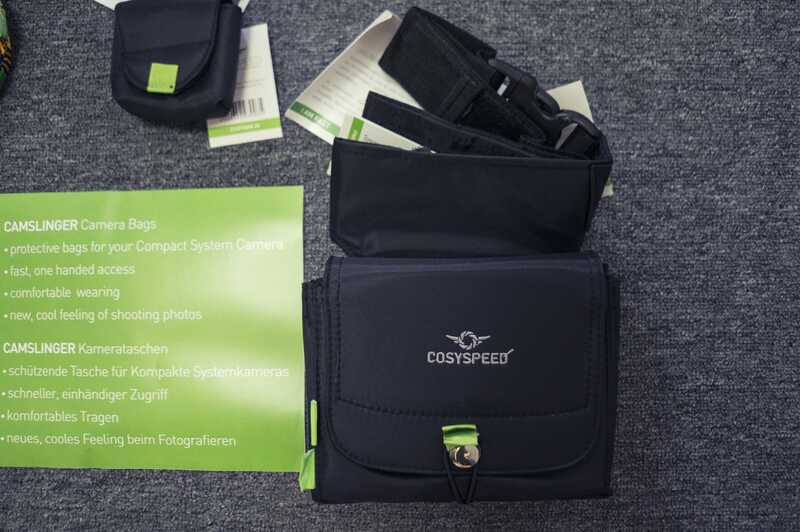 After examining the website and the manual, I noticed that the Cosyspeed Camslinger Camera Bag only comes in black with green labels, tags, etc. The COSYSPEED green is a nice colour but personally I would have liked to have had more options here. A completely black Cosyspeed Camslinger Camera Bag would have been awesome, or one in khaki with light brown lines around the edges. I feel that this is restrictive and I believe that for a Street Photographer, bright green colours are a no, no, because they draw unwanted attention. Bottom line is: Limited colour combinations. COSYPSEED green is too bright. The Cosyspeed Camslinger Camera Bag has excellent build quality. It is made of a very durable material that seems to be waterproof. It is certainly dust proof. On the inside of the Cosyspeed Camslinger Camera Bag there is a thick protective padding all over that keeps your camera secure from scratches. It also comes with tons of separators so you can configure the interior of your bag in any way you like. What I have done is I have have made a very thin pocket for my lens cap and I just drop my camera in the bag without the cap. Because of the soft padding, my lens doesn’t scratch and I don’t have to keep my lens cap in my pocket. The waste clip secures with a double securing system that is designed in such a way that it can’t be accidentally opened and the straps are thick and strong. The labels, the metal parts such as the clips or buttons, call them what you like, are all of great quality. The only thing that could make the product quality better and that is why I score it with an 8 is that a leather version would have been simply awesome! Bottom line is: The build quality is great. I would have liked the option of a leather one also. I can’t really say anything negative about the durability of this product. I have been using it on a daily basis for a month and it still looks as if I unboxed it this morning. Both inside and outside the bag nothing has changed. Everything is durable. The outer fabric, the clips, the labels, everything. At one stage I had my little daughter piggy back me and I was wearing the Cosyspeed Camslinger Camera Bag. So, without me noticing she rested her foot on the CAMSLINGER and I realised when we got back home. I thought that the dirt from the shoes would be hard to come off and would uncover marks or scratches, but to my surprise once I wiped the bag with a wet cloth it looked good as new again! Since then this has happened quite a few times. Each time the Cosyspeed Camslinger Camera Bag preserves it’s quality and proves it’s durability. The part of the bag that touches my body that is rubbed on me while I walk or cycle (yes cycle) is still new and durable also. Bottom line is: This bag is durable. Street shooting for long hours and I need a place to put my camera. Street shooting before or after meeting friends. Because the Cosyspeed Camslinger Camera Bag doesn’t require me to have any hands occupied, I find it to be the best bag for when I have to have both my hands busy. So it is ideal for when I am out with my little daughters that want to each hold one of my hands. That way I can have my camera with me, without hanging it around my neck and hold my two daughters hands. If you have kids, you will know that hanging a camera around your neck isn’t a good idea. When you need to bend over, the camera usually bangs on one of your children’s heads and when you need to carry one of your kids, you have to move the camera to your side otherwise risk damage. The other option is to hand it to your partner, but we are trying to keep our gear on us at all times here. We are Street Hunters! When I am cycling the Cosyspeed Camslinger Camera Bag is perfect. I have my camera on my hip. I see a shot. I stop, pull it out and make a photo. Easy. I used to hang my camera around my neck… Bad idea. It was too annoying. I tried carrying it in my messenger bag but that was too big and the backpack was simply a silly idea, because each time I had to take a photo I wasted 10-15” to get to my camera. 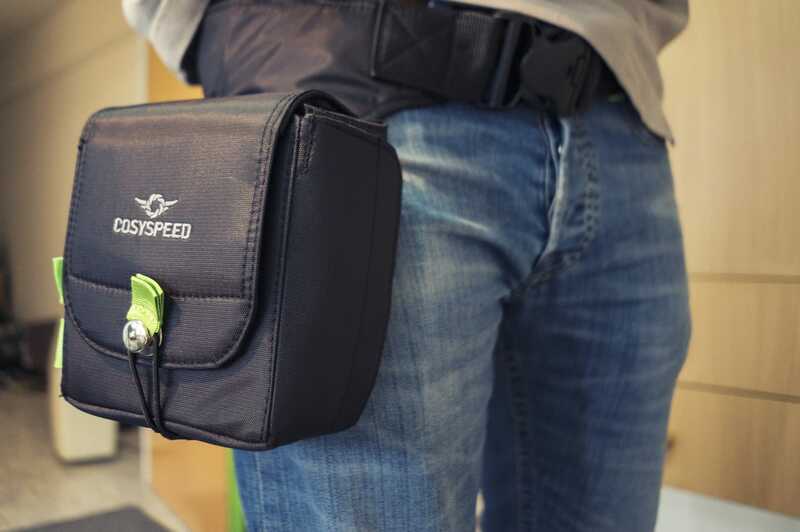 The Cosyspeed Camslinger Camera Bag is perfect for cyclist Street Photographers. Lastly, when I go shooting for long hours or I plan to meet someone before or after my Street Hunt, the Cosyspeed Camslinger Camera Bag offers me the ideal storage for my camera and gives me the freedom I need for my hands. Oh yes, it is so comfortable that I tend to forget I am wearing it. The only time I remember is if I accidentally bump my right hand on it or sit in a tight chair. Bottom line is: I am very satisfied with the ergonomy of the CAMSLINGER. 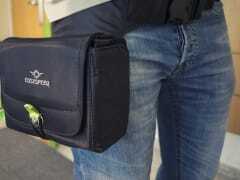 The CAMSLINGER sells it self as a Gunslinger holster for cameras. That is where the name CAM-SLINGER comes from. As far as I am concerned the CAMSLINGER isn’t the tool for the fastest draw a Street Photographer can achieve. I timed my speed in 5 different situations and found that the CAMSLINGER wasn’t the fastest, or the second fastest. It was the third fastest! I used the camera with a wrist strap, a neck strap, a messenger bag and a backpack. The messenger bag and the backpack were closed tight, and so was the CAMSLINGER. Now, I wouldn’t have done this test, but because I am a Street Hunter and in Street Photography speed is of the essence, I thought this test was 100% necessary. Bottom line is: It is the fastest BAG, but not the fastest draw for a Street Photographer. I literally didn’t know the cost of the Cosyspeed Camslinger Camera Bag before I wrote this review. It is something I had never thought about because the guys at COSYSPEED were fantastic and sent them over to us for free and as gifts. But what if I had to purchase a Cosyspeed Camslinger Camera Bag? So I checked the prices to see what it costs. In the European union the 105 costs €88,99 and the 160 costs €99,99. In the USA the 105 costs $109 and the 160 costs $119. You can check the prices in the authorised dealers websites that you can find on the COSYSPEED website. Now, would I pay that much for it? No. My lowpro messenger bag costs €30 and my backpack costs €50 and they both carry many more things. But wait a minute I need the COSYSPEED for Street Photography. Well, I could always use my camera’s free neck strap or buy a very good leather wrist strap for half the price of the Cosyspeed Camslinger 105. Yeah but the quality is great and the ergonomics of the bag are unbeatable, but on the other hand it only comes in black with those bright green labels. Hmmm, so would I pay €88 for the 105? Probably not, but this is something that each person values differently. The score for price / value for money is something that might not be considered as a solid metric, because for somebody else that price range might be good value for money. Bottom line is: Personally I think it should have been priced a little less. Maybe if I had more colour or fabric options I would not have minded though. 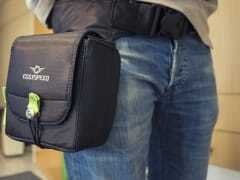 The Cosyspeed Camslinger Camera Bag is a fine product that I enjoy using very much. After a month it has become my number one choice for when I hit the streets AND I need to do other things at the same time or before / after. The build quality is great, it is very durable, comes in good sizes, it isn’t heavy and it doesn’t get in the way. It isn’t the best choice for a Street Photographer that needs to shoot fast. The neck and wrist strap are much better options for the “fast draw”. That doesn’t mean that it isn’t good for Street Photography though. It is. I use it as I mentioned very frequently. Would I manage without it if I never had one? Yes I would because I can’t justify the cost, but as I said before that is a personal thing. Now that I have it though, I am not giving it up and I feel grateful to own one. Would I recommend it? Yes I would and I do but again you should get this only if you feel comfortable with the cost. All in all the Cosyspeed Camslinger Camera Bag is a good product that many of you will find great! What is the final score? 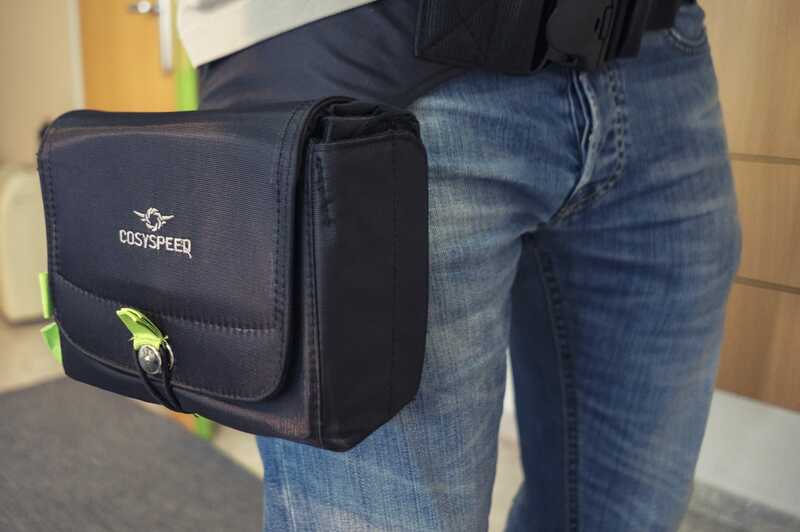 The Cosyspeed Camslinger Camera Bag is a camera bag that is worn around the waste and hangs on the side of the wearer, giving him/her immediate access to their mirroreless camera. It is made by COSYSPEED in Germany. Nice review. Probably something I would consider at a lower price just for fun. The only thing that did confuse me, was that you said “…based on ‘our’ experience of using it…”. The rest of the article is written as if Spyros was the one who used it. I look forward to more reviews. Keep up the good work. Mavritis thanks for your comment! You are absolutely right about your comment! I was the one who used it. I must have written our by accident. I will correct it. The review was good. I would not use the bags because they seem too bulky for me. When I’m out and about shooting I carry one lens attached to the camera along with a strap. Keep it simple is what I’ve adopted. Thanks for commenting Mark! I am glad you liked the review. I use the small Camslinger when I am out and about with the kids. It is so much easier for me to carry my camera with me that way. When I am out alone though, I tend to only carry my camera, in hand and that’s all. I will take the Camslinger with me when I am alone, if I have some other place to go before or after my Street Hunt. I have heard about those Mark. Never tried one though. great review. The one point you did not make about the fastest draw 🙂 is that while it was number 3 as opposed to wrist and neck strap, was the fact that the camera is also protected from the elements. I think that is important even when the cameras we use are weather resistant. Hi! Recently I bought the Camslinger 160 and I am bit wondering that in none of the reviews I have read the fact is mentioned that the the cover is suddenly NOT fully protecting your expensive glasses inside against rain. Especially in case you have chosen for the greatest volume you can clearly see from above that at the right and left are holes where water can come inside freely. Nobody has noticed this? Or it is not a problem in practice? Hello Hans. This has never happened to me, even in heavy rain. Do you overfill the bag? I think that if the bag is overfilled it might have openings. I will ask Thomas Ludwig of Cosyspeed to jump in and give you his opinion on this too. Cheers!